Three years ago tonight I was trying to decide whether or not I was in labor. 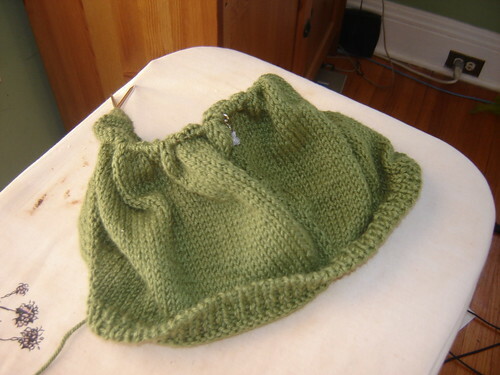 Knittykid arrived quickly, so fast that out of all three births his is the biggest blur…going to bed, thinking that maybe something was up, the Skeptic getting home from work, a call to our doula, a drive to the hospital. Just enough time to check in and then he was there, beautiful blue eyes, little bald head, nuzzled up on my chest while the oh-so-kind nurse just let us be for a long while, no weighing, no bath, just cuddling up with our wee boy, amazed that just like that, he was here. And now it’s been three years of blessings, sweetness and smiles. The Skeptic is working away in the basement. 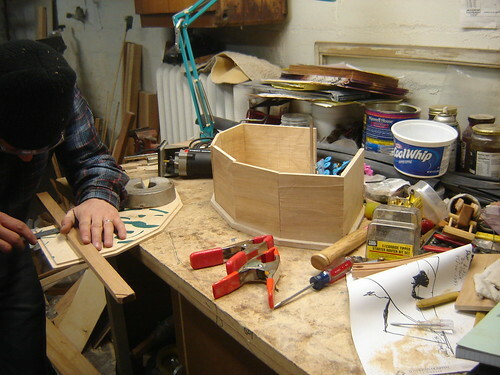 He took charge of making Knittykid’s gift this year, (a roundhouse for his trains) and just like us knitter’s he’ll be burning the midnight oil to get it finished up in time. I’ve got it easy. I’m heading up to my workroom to make a felt birthday crown for him. Although tomorrow I’ve got it tough as I attempt to make this. The soccer bear is his choice. I’m terrified, as I can barely frost a cupcake, so it should be interesting, and I promise to post the results. Wish me luck!! 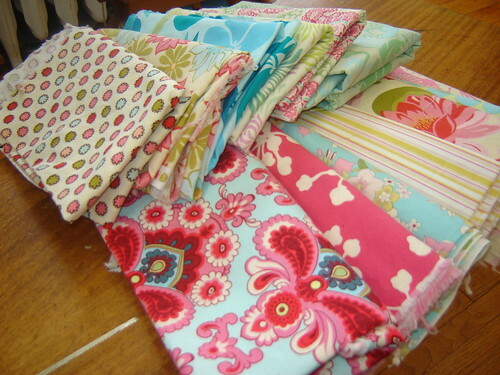 I’m quilting along in full force. I have no idea what I’m doing, as this is my first quilt ever. So I’m going by the wise instructions of Elizabeth Hartman at Oh Fransson! and then figuring things out with Annik (the instigator) and our friend, (blogless) Karen who actually knows what she’s doing as far as quilting goes. 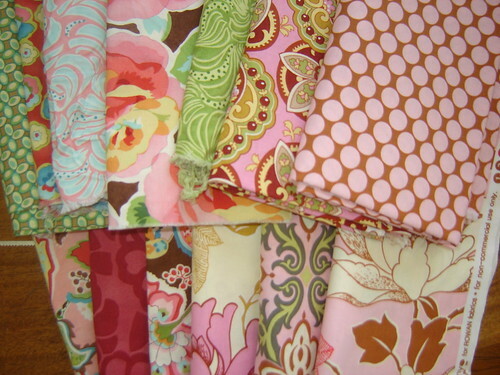 (She’s taken classes and therefore is our Quilting Expert). So far, I’ve done nothing but sort fabric and figure out supplies but I’m having a jolly old time. 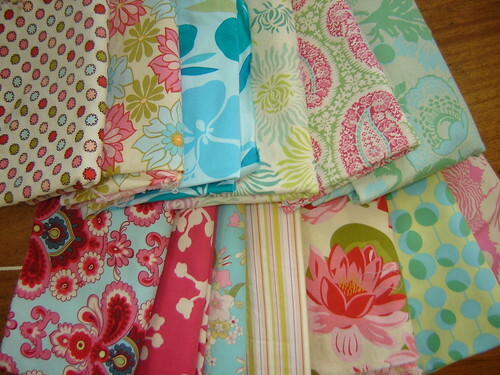 One cool set, pinks, blues, greens…. 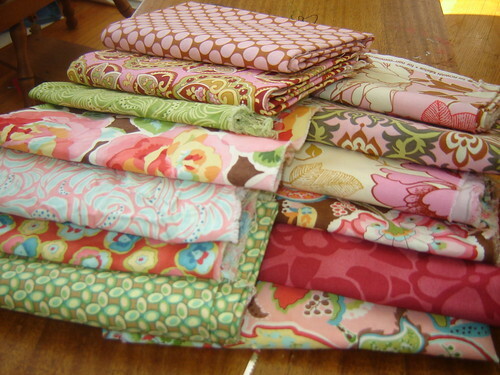 I’m leaning towards the cool set, although it would be nice to use the warm set since it is made up of a lot of fat quarters. The cool set is all full yardage. Thoughts? Any certain fabrics that work or don’t work? (I should have numbered them). I’m not sure I’m totally happy with either as nothing is really saying “that’s it!” to me. I might have to dig through the stash some more to see…. 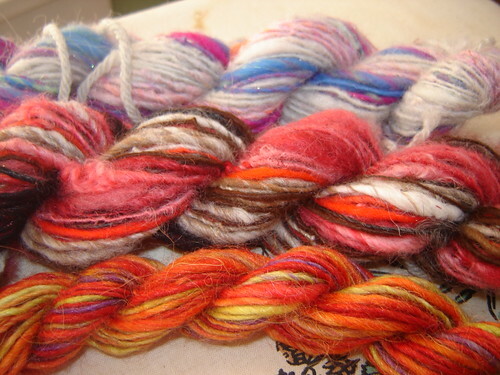 I divided it into reds/browns, pinks/blues, and the last was from one individual sample of roving. More details once it’s knit up! If your own dentist ever tells you you don’t need to take your kids in to see them until they are three, tell them they are BEHIND THE TIMES and get that kid in by the time they have teeth. Poor Knittykid went under general anesthesia yesterday for two root canals, four crowns and four cavities. All would have been avoided if my dentist, as well as the first dentist Knittykid visited, weren’t medieval. Needless to say, I’m mad. The good news is that he’s a trooper and bounced right back to his usual self by dinner last night. That’s my boy! So Funny Magic is spearheading the idea of Favorite Room Friday, and I had to make sure I posted on this one. I’m sure she’d love it if you played along too! I had two decisions to make: which room, and do I clean it? 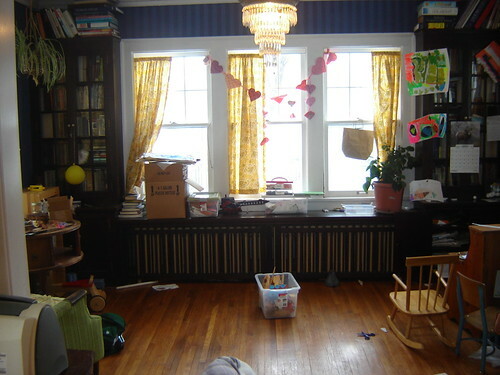 Which room was tough as I love both the sun room and my workroom. 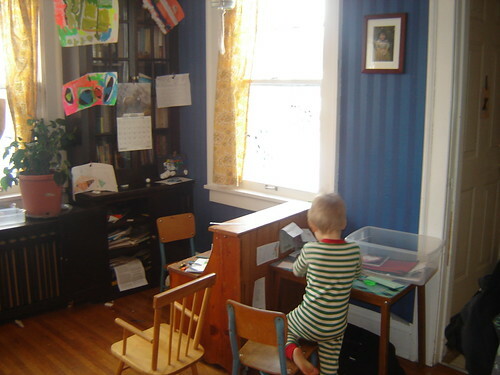 But I’ve shared my workroom with you before, and the sun room lately has been a much favorite spot for the whole family, so the sun room it is. To clean it? Well, I decided to do all moms out there a service and show it in it’s reality as it is this morning. Complete with an untidy nature table, box of old books that need to be sorted, and general untidiness. 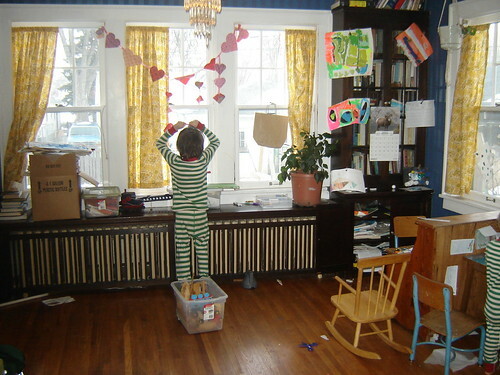 The floor is dirty, the Valentine’s decoration still hanging, and it’s under the light of a gray Minnesota morning. The boys have their corner…. 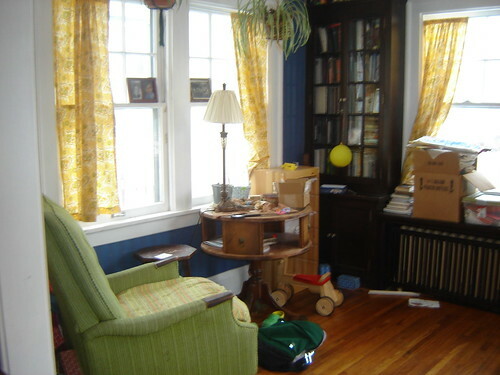 I can sit in this room with the boys while they work in my vintage recliner, the one my grandfather always sat in when he visited, with the sun shining and maybe a bit of knitting with a cup of tea. In the warm months, I can sit hear and see the boys playing outside while I listen to their chatter. I usually choose to just be one with mess that is, and save the cleaning for later. So what’s your favorite room?? I can’t leave this post without also giving a huge thanks to Emicat! (I’m so behind this week!) 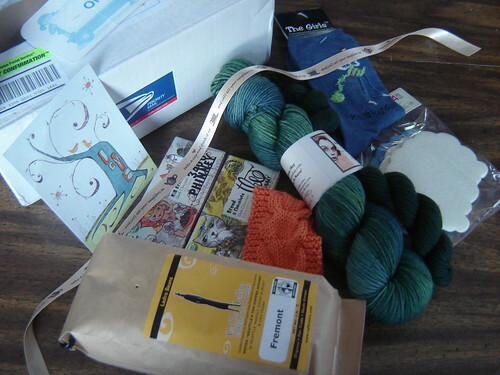 She was my Knitters’ Coffeeswap IV partner and boy did she pull off a great package!!! She was a perfect partner since we both love organic, local and fair trade! I got some amazing Seattle coffee from Cafe Ladro along with some phenomenal local chocolates! She sent me some sweet knitter socks and some felt sheep coasters that my coffee has been resting on all week. 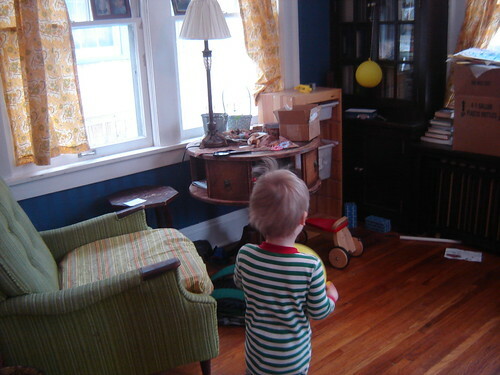 (At least when Knittykid hasn’t stolen them, he loves them too). There was also a hand knit coffee cozy in my one of my favorite colors these days! And of course, she read my mind and realized the Duet sock yarn was one of the yarns I keep looking at and coveting;, she sent some in a beautiful green colorway. (She knows the dyer, how lucky is that??? )I wish I’d taken a close up, but I had to take my picture quickly before the boys came down and saw there was chocolate in the box. Thank you so much Emicat!!! 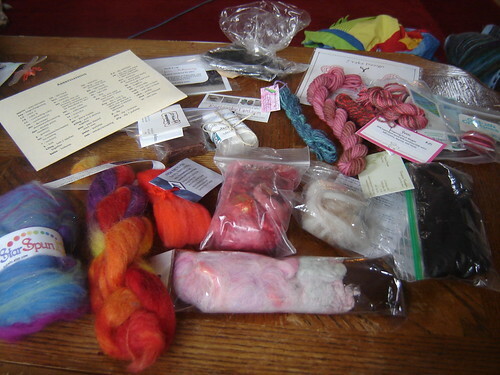 This was a totally awesome box and everything fits me to a T. You make me want to visit Seattle right now!